Insect growth regulator inhibits re-infestation of fleas for up to seven months. I.G. 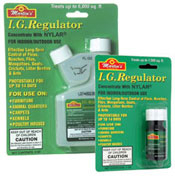 regulator inhibits larvae from advancing to adult in fleas and horseflies. Can be used on carpets, rugs, furniture, draperies, poultry houses, animal quarters, kennels, doghouses, and warehouses.